News from all over the X-Plane world! 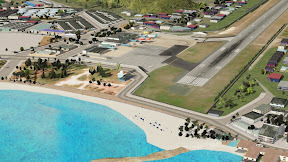 Butnaru has released San Andres Island as his latest scenery product. The island is a coral island among the Colombian islands in the Caribbean Sea. “Geographically near Nicaragua, it is historically tied to England, and politically part of Colombia. More information on this product can be obtained on the product page at the X-Plane.org Store. Super Critical Simulations Group has released their rendition of the EMB-170. This aircraft is primarily used in the airline industry as a regional jet, though has a great range to allow for longer flights. The project is considered more of a "lite" product where much of the simulation is default X-Plane systems, but most of it has been modified as much as possible to match that of the real EMB-170. You may find more information or purchase this product at the X-Plane.org Store. 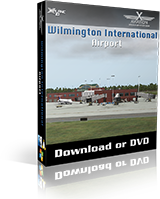 X-Aviation and Drawbridge Designs are pleased to announce a 35% Off super-sale for the Wilmington Int'l Airport scenery pack! This sale keeps the celebration of this latest release rolling as X-Plane's most advanced scenery for X-Plane yet! Many reviews have come in with overwhelming joy and enthusiasm for this scenery, so if you haven't got in on this product yet be sure to do so before the countdown for the sale hits zero! See more about Wilmington on the product page at X-Aviation. 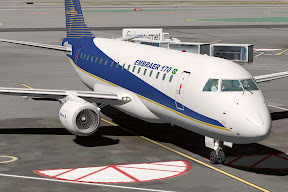 X-Aviation has a new blog post detailing the status on certain upcoming projects, including a never before seen screenshot of the upcoming Saab 340 project from Leading Edge Simulations. You'll also find news on the RealScenery NORCAL release! 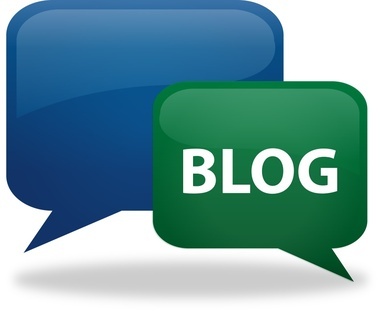 Head on over to the latest entry on the X-Aviation Blog! 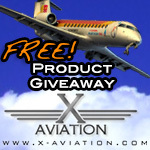 X-Aviation has announced a free giveaway! Five people will be selected out of those who follow the extremely quick and painless way to enter the giveaway, and those five will be able to select ANY product on X-Aviation free of charge! You can learn more about the giveaway at the X-Aviation giveaway page. We are working with ATI and will come up with something more permanent before we finalize 10.10. Default Aircraft startup times drastically improved! Sometimes on piston engines, you may even need to crack the throttle to get the aircraft to start...just like real aircraft! The starter has been changed quite a bit; airplanes from v9 and 10.05 should now start as expected. See this post for details. Slung Loads are no longer defaulted ON...this was preventing the B-52 from flying properly! Plane-Maker can import .inst instrument files. Light billboard color-space fixed; the runway lights should be quite a bit more visible now. Fixed road bridges crashing into each other. Improved ramps going into road junctions slightly. Fixed P-180 panel going black when P-180 is used as an AI plane or HDR is turned on and off. Fixed missing landing light in 2-d cockpits and forward views. Jets will hot-start if __N2__ is below indicated value in Plane-Maker. Plane-Maker used to use N1 for jets, which was difficult to work with. Ramzzess Aviation Design and Philipp Avionics have released their eagerly awaited 777-200LR project! 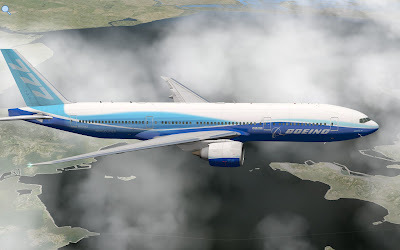 This aircraft is said to have been worked on closely with real-world 777 pilots, engineers, and 777 3D CAD files provided by Boeing. The aircraft simulates many systems, including the Electronic Flight Bag and a custom FMC. 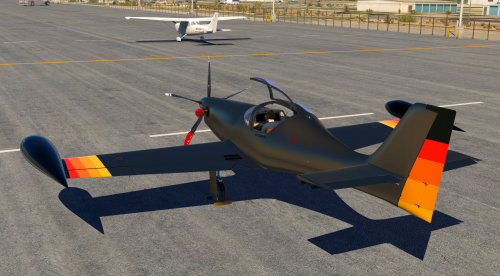 You can find more information or purchase this aircraft for $59.95 from the X-Plane.org Store. 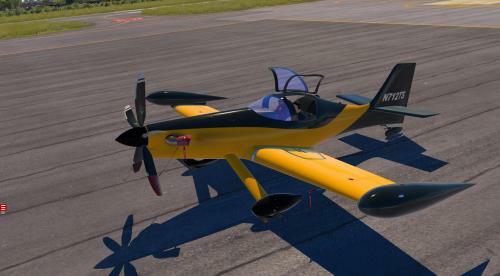 Alabeo has released their second product for X-Plane: The Sukhoi 26. 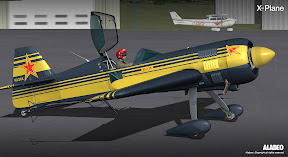 The aircraft includes a highly detailed 3D model, a paintkit for creating your own liveries, as well as free liveries available upon purchase. You can find more information or purchase this product at the Alabeo webstore. Maxx XP has released what is told to be the final push of UrbanMAXX Extreme. This version is labeled as 2.0 3D. Quoting the products website, it states "UrbanMAXX integrates into X-Planes 'Plausible' environment seamlessly but it also gives you the ability to dial down your rendering options for better performance." A review by XSimreviews is available for you to read on their blog website. 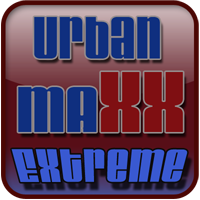 UrbanMAXX Extreme 2 3D is priced at $7.95 and may be purchased at the Maxx XP webstore. 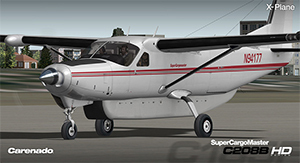 Carenado has announced an upgrade extension package made available to convert the base pack Cessna 208 into a Super Cargomaster variant. The upgrade is sold for a very reasonable $7.95 and may be obtained at Carenado's web store. Go to the SETTINGS menu in X-Plane, INTERNET OPTIONS window, IPHONE/IPOD tab, and turn on the ForeFlight option. Then, get ForeFlight from the App Store if you are the last one to have not already done so and run it! This is a map system that myself, and most other people, use in the cockpit, which is about ten million times better than using paper charts! Go to the (MORE...) menu at the bottom of ForeFlight and the to DEVICES item on the left. Touch it, and see the X-Plane window that appears... touch that, too, and a window will come up that lets you ENABLE it. Now, simply fly X-Plane with ForeFlight running on the same wireless network and you can use ForeFlight just like you would in the cockpit! Cool! Supersonic engine thrust model improved to go from total pressure recovery to normal-shock recovery as you move towards the max inlet efficiency, and pass air subsonically to the compressor behind the inlet. This is still not a perfect inlet model since different inlets work in totally different ways, but this is the best superonic inlet model we have ever had, and the supersonic drag is now the best we have ever had as well. The supersonic drag model looks at each polygon of the acf model, finds its' normal vector and area, and treats it as a plate with a compression or expansion fan, and should now do a perfect job of tracking every single poly in the airplane.The new supersonic model, like ALL of the dynamics in X-Plane, considers all of the various bodies that you have created for the airplane. That is: ALL of the fuselage, misc bodies, nacelles, etc, are considered to be exposed to the airflow. This means that if you have multiple bodies one inside the other, the aero effects will be DOUBLED compared to reality! Also, if you have one body hiding right behind another, or behind the fuselage, then the drag effects will be DOUBLED compared to reality! This is why with the latest beta, some planes are not going supersonic that should: We are now computing the drag more accurately on each body, and having multiple bodies one behind the other simply add up the drag based on the frontal area of EACH BODY! A very simple case of this is an F-104 Starfighter model that uses a fuselage for the FRONT of the plane, and a misc body for the BACK! In this case, the front of the misc body is acting like a big flat-plate exposed to the air.. surely enough to keep the plane subsonic! So, to design a plane properly, do NOT use misc bodies and fuselage and nacelles stacked inside each other, or behind each other in a row. This will simply erroneously add up drag! When designing a plan e for X-Plane, the rule is really very very simple: Each fuselage, misc body, and nacelle has the local air aciting on it. That's it! So it is actually really simple. Now, there is ONE exception: Engine nacelles for jets. Engine nacelles for jets are assumed to NOT produce any drag. This is because the thrust for the engine that you enter in Plane-Maker is considered to already be based on installed thrust losses. So, if you want your ACF model to be accurate, then do not have hidden-away misc bodies with frontal area inside another body, and certainly do not have 2 bodies one behind the other to make a long body... the frontal area of the aft body will still be exposed to the air in X-Plane! If you want really detailed geometry (read: more than you can get out of a body in X-Plane, so you want to hook multiple bodies together) then it is time to build an OBJ for your airplane! ForeFlight support! Grab ForeFlight version 4.7 and you can now use X-Plane as a "GPS" to practice your flying. New commands: Spot lite on, off, and toggle... kind of sorely missing before! Helo rotor rpm trim runs 0 to 1, so it is an interpolation between the lo and hi rotor rpm trim. This way, motion of the trim always DOES something, even if only a high OR lo rotor rpm trim is entered in Plane-Maker! Automatic crash reporter no longer catches crashes that occur because of plugins. This is important so that plugin authors can get crash data from their users without us stealing it from them. UI Buttons in all products have been improved to be...well...like every other button you've ever used outside of X-Plane. Actions happen on the up-click, not the down-click giving you a chance to change your mind while also giving you visual feedback of the press itself. This build should fix the bug where the shadows would jitter and shake wildly with HDR enabled; the shadows should now be about the same with HDR on or off. (Global melt your GPU looks better with HDR on.) Some airplanes that previously did not shadow properly are now fixed. I am still working on shadow tuning. Joystick Dialog now consolidates axis display so more device axis are visible. Important for people with many devices. Joystick calibration ranges from 10.05R1 are now blown away to prevent corrupt axis on an update. NOTE: This will require EVERYONE to recalibrate their devices on updating. 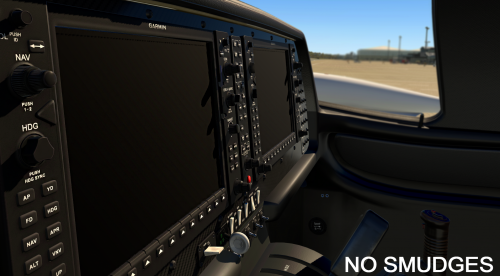 You can now save a situation and then load it again without exiting X-Plane to re-scan the file list. Landing lights and all other lights should go across to the external visuals now. QuickFlight startup does put you on the ramp now, if set up as such in Operations and Warnings window. Right Click/Zoom no longer control the sim from IOS station. Fixed bug in planemaker causing resource copying to create invalid files on Windows. Fixed dlerror __stack_chk_fail_local on Linux machines. Ideally, plugin authors should be compiling with -fno-stack-protector but in the meantime, this will let them run again. Roads shouldn't cut into buildings at low view angles. Fixed crash when starting up with IOS enabled and quick flight showing on startup. Fixed cursor being hidden in joystick calibration wizard. Fixed cut-off object names in Plane-Maker main screen. Fixed prioritization up/down buttons in plane-maker misc objects screen. Added error checking for airplanes whose use of panel texture is inconsistent. You can't mix and match ATTR_cockpit and ATTR_cockpit_region!!!! Plugins are now exempt from breakpad; if a plugin crashes, the normal OS crashes happen so that the user can send a report to the plugin author, rather than the crash going into our database. Fixed camera instrument to not turn green during the day with panel regions.